The Rhode Island-based brand is returning to its roots. 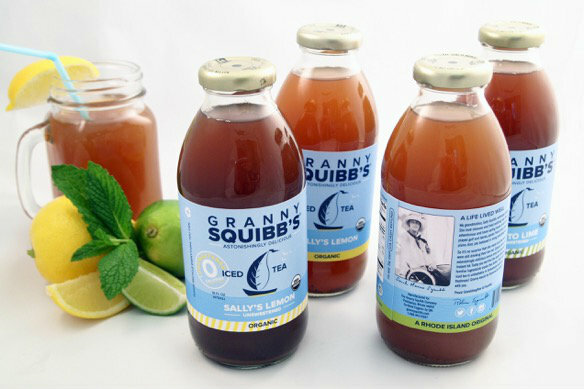 Granny Squibb’s iced tea has come full circle. The story of the beverage began in the 1930s, when Sally Squibb and her family spent the summer in Saunderstown overlooking the bay. To fight the heat, the young mother began to take fresh brewed black tea, adding fresh lemon juice, spring water, cane sugar and mint. It eventually became known as Granny Squibb’s iced tea, and the recipe still makes the rounds in Saunderstown today. Six years ago, granddaughter Robin Squibb took the beloved recipe and turned it into a company, with distribution out of New Jersey. Now, the brand has returned to its home kitchen roots by going completely organic, Squibb says. They’ve always used lemon and lime juice, but now they along with the mint oil are all made with certified organic ingredients. Squibb’s grandmother may not have called her ingredients organic, but her granddaughter sees it as a return to the high-quality ingredients her grandmother used. (There are no preservatives or high fructose corn syrup in their teas, which come in classic tea and mojito lime, in sweetened and unsweetened versions). With the organic ingredients, bottles will cost from 10 to 20 cents more, Squibb says. They are available at most Whole Foods stores. The brand has also freshened up its labels and is working on new concoctions. Their mojito iced tea has paired with dark rum to make what’s known as a Squibbwreck and they’re also working with Revival Brewing on a combination of beer and iced tea called the Grandy. Sally Squibb would probably drink to that.